I've had a few requests to write a post about my everyday skin routine and all the products I use, so here I go! 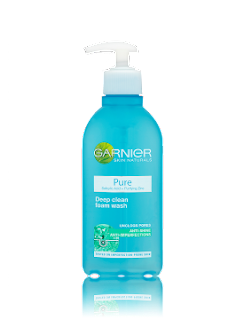 For many many years my go to face wash has been the Garnier Pure Deep Clean Foam Wash. 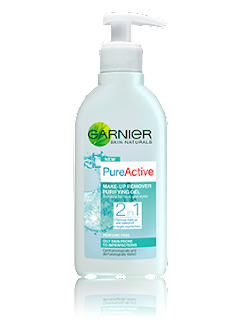 I pretty much swear by it and when I don't use it my skin just doesn't feel as clean. It's extremely affordable and goes a long way. This is what I use in the morning when I wake up. However, when I wash my face after a long day of wearing makeup I first use the Garnier PureActive 2IN1 Make-up Remove Purifying Gel. This is a relatively new product and I recently incorporated that into my evening routine. I find that it is a great first step in removing makeup. I then follow it up with the Deep Clean Foam Wash.
After that I let my skin air dry, or gently pat it dry with a soft towel. Since I do have oily sensitive skin, which can be prone to breakouts I try to be as gentle as possible. My breakouts have definitely decreased as I've gotten older but still get the odd one here and there. In general though, for people who do have acne prone skin, you should be as gentle with your skin as possible as any irritation can cause the bacteria in your pores to get infected. Once my skin is dry I follow it up with moisturizer. During the day I use the Murad Oil-Control Mattifier with SPF (click here for review). In the evening I use the Nivea Aqua Visage moisturizer. I love this because its extremely light and absorbs into my skin right away. It's perfect for oily skin since its water based. Unfortunately they discontinued selling it in the UK (I contacted Nivea reps and they informed me that it was due to low demand). So now I stock up on it whenever I visit home in Canada. As we get older its also important to start moisturizing and thinking about wrinkles, especially around the eye area. 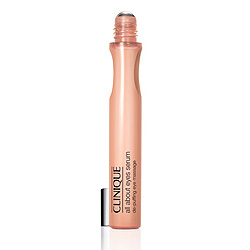 I use the Clinique All About Eyes Depuffing Eye Massage Serum twice a day. The serum is instantly cooling and its really great at keeping away dark circles and getting rid of puffiness. Lastly, 3-4 times a week I use a gentle scrub on my face to exfoliate and get rid of dead skin. 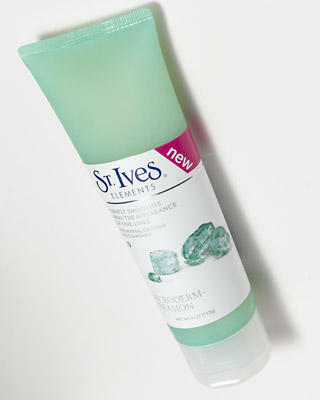 Since my skin is sensitive I can't use anything too harsh so I use the St. Ives Elements Microdermabrasion Scrub. I really love this product because its not as harsh as their very popular apricot scrub which a lot of people swear by. This is quite gentle but at the same time gently exfoliates to reveal clearer skin and minimizes pores. Once a week I also use my favourite scrub/mask - Soap & Glory 'No Clogs Allowed' (click here for review). Hi! Thanks for sharing your everyday skin care methods. You're using the products from famous brands. For night time I'm using Evening Rich Nutritional Moisturizer from Devita. I am happy that this product delivers. The texture is great, it moisturizes very well, and has excellent ingredients (peptides, hyaluronic acid). In case you're somebody who routinely experiences oily skin, your magnificence administration can be a bad dream. You may have the best peeling administration known not, yet no sooner have you purged your face and you will feel the oil starting to return. Oily skin isn't probably one the more high maintenance skin types, naturally it's more to getting break out and bacterial infections. It leaves many wondering how many times a day should it be washed? What is the best face cleanser for oily skin? Tretinoin works in a simple way to solve these two skin problems. One is that it hastens the renewal of skin cells such that new skin cells surface and sheds off the old and dull ones. My friends suggested me to read this post and I am extremely happy that they did that. This proreviewly post is one of the most brilliant posts that I have read in my life. The information I gathered from this was very special and it helped my work out a lot. If you would continue to provie more posts like this one, then that'd be great.